Since the release of their album Loss, the nihilistic metal assailants known as SEEKER have not halted the brakes behind support of “one of the most aggressive albums of the year,” as described by metal pundits Aardschok Magazine. 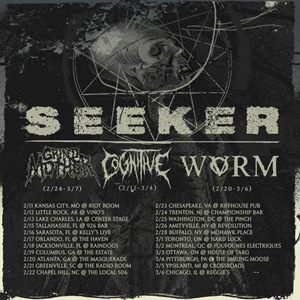 Following a December headlining tour, SEEKER has now unveiled plans for 2017, including US and Canadian tours with THE GRINDMOTHER and PSYCROPTIC, and a stop at the Modified Ghost Fest in Vancouver. SEEKER has released three videos from the album, “Submit”, “Void” and title-track “Loss”.